From initial design and prototyping through to final production, we provide the customer with a simple solution to that complicated problem. For over 50 year`s G&M have been the industry pioneers in the Design & Manufacture of Copper Brass heat exchanger cores, supplying the Specialist Radiator market & OEM Customers with a high quality, competitively priced solution to their cooling requirements. Over the last 10 years we have added complete heat exchanger packages in both Copper Brass and Aluminium. Based in Glasgow, Scotland our 100,000 sq ft manufacturing plant and storage facility is ideally situated for fast & efficient worldwide distribution. G&M`s technical abilities are second to none with a full team of engineers specialising in all aspects of cooling system design and manufacture. 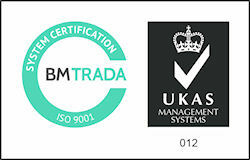 G&M Radiator are certified to ISO9001:2015 for the Manufacture of Automotive, Commercial and Industrial Radiators, Radiator Cores and Associated Components. G&M uses such processes as FMEA, PPAP, Control Plans, Process Flow Charts, Process Work Instructions and our Quality Management System to ensure parts are fit for application and manufacture is controlled. G&M Radiator are certified to ISO14001 Environmental Management System for the Manufacture and Supply of Automotive, Commercial and Industrial Radiators, Radiator Cores and Associated Components.